The aerial image that went around the world. Aerial images published by Bab al-Sbaa media center on 27 July 2013 (pic.1; pic.2; pic.3). Aerial images published by Shaam News Network on 29 July 2013 (pic.1; pic.2; pic.3; pic.4; pic.5; pic.6). Aerial images published by AFP/Getty Images on 29 July 2013 ( pic.1; pic.2; pic.3). SYRIA, HOMS : A handout image released by the Syrian opposition’s Shaam News Network on July 29, 2013, shows an aerial view of destruction in the al-Khalidiyah neighbourhood of the central Syrian city of Homs. Government forces bolstered by Lebanese Shiite militiamen were poised to retake the largest rebel-held district of Syria’s third city Homs, a watchdog and state media said. 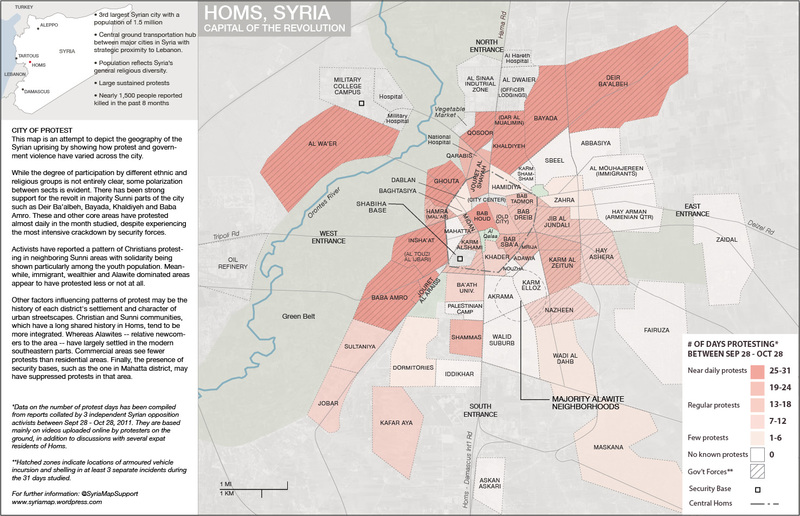 The aerial images’ field of view transposed onto an annotated satellite image of Homs. Close ups of the men visible in an aerial image published by SNN show the presumed drone operator, transmission recipient, and shadow cast by the drone. Annotated aerial shot of Homs depicting the progression of regime forces’ control, in June-July 2013. Photo of the downed DJI F550 drone published on Bab al-Sbaa media center’s Facebook page on 27 July 2013. The Homs aerial shot, color-alterated and filtered, resembles a Gerhard Richter painting. And following the much publicized deaths of Sunday Times reporter Mary Colvin and French photographer Remi Ochlik, which further discouraged reporters from entering Homs. This number was reached by comparing the approximate location (i.e. the bottom left hand corner of the aerial shot) to Google Earth imaging. Due to the angle of the camera and the fisheye lens effect, the altitude might be lower, closer to 100 m.
 Note that al-Khalidiya is located to the north of the center of Homs. District borders appearing in the map are an approximation. To identify districts borders in Homs, these documents were mainly used: fig.1, fig.2, fig.3, fig.4, and fig.5 were mainly used. The area in question is Wadi al-Sayeh. According to this article, it is delimited by Karm Shamsham and al-Nour mosque to the east, Hama [Fares al-Khoury] street and Khalid ibn al-Walid Mosque to the west, al-Khalidiya to the north and north east, al-Hamidiya to the south, and Bab Tadmor to the south-east. Wadi al-Sayeh is the name of a street connecting Bab Tadmor roundabout to the vicinity of Khalid ibn al-Walid Mosque. 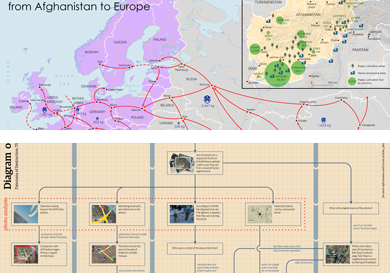 This infographic plots the line of inquiry and methodology adopted to investigate the widely-circulated aerial shot of Homs. This post was originally published on Exit Left, 23 August 2013. Co-author: Emily Dische-Becker.